You know you need a new website. And, you want to use Squarespace because it’s easy to edit, so you can focus on running your business instead of solving multiple tech breakdowns. But who do you choose to design it? It’s important to choose a designer you connect with. Your Squarespace website designer needs to be someone who ‘gets’ you. Not just your business, but YOU. Why you do what you do, and how you use your website as a platform to help others understand their unique gifts, passion and purpose. Finding that designer who really resonates with you is hard enough, but once you find them, then what? Download the 10+ interview questions to ask a designer checklist! It can seem overwhelming trying to manage a rebranding project on top of your regular client workload. But it’s important to ask your new designer some questions and really get to know them before you start on this journey together. You want to ensure you’re working with a high vibe entrepreneur (like you!) who’s going to understand your dream business vision, and bring it to life. 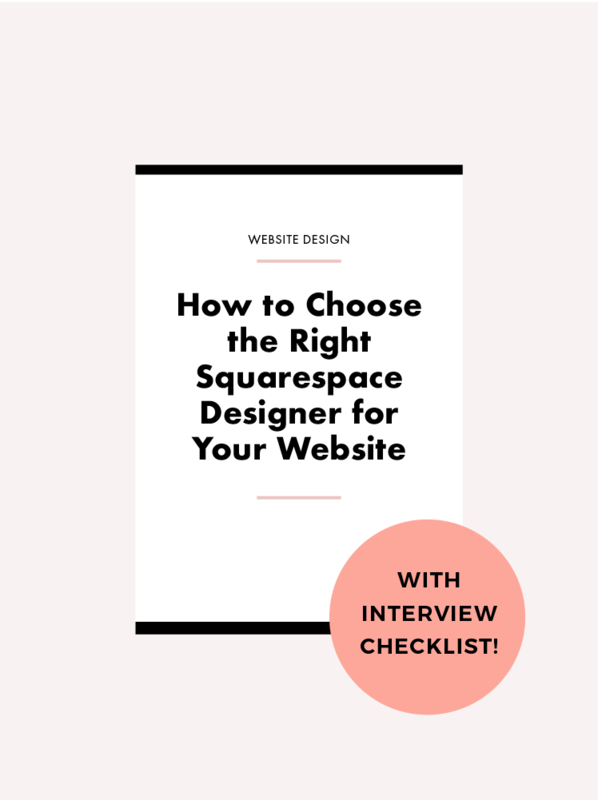 Once you’ve reached out to the Squarespace designer you connect with the most, here are a few questions to ask them. These questions make sure you not only vibe with your potential designer, but also that you’ll be well taken care of before, during and after your web design project. This is the most important question of all! You know why you do what you do, whether that’s coaching, blogging, or something else that connects with your soul. You deserve to work with a Squarespace designer who’s going to uplift your spirit and mission, and be in total alignment with your big dreams. So ask them why they design, why they enjoy what they do. If the answer doesn’t feel like it aligns with your purpose, keep looking for your perfect fit. 1. What time commitment will you need from me? As a coach or creative woman, you’re probably exhausted by the end of the day. It’s important to know ahead of time when your Squarespace designer will need input from you so you can plan your workdays accordingly and not get overwhelmed. I provide a detailed timeline in my proposals so you know exactly when I’ll need you. 2. What resources do you need from me? Your designer will need a bunch of things from you! The basics include your current logo (unless you’re getting a new one as part of a rebranding package!) and website URL. But it goes a lot further than that. You need to share your goals and inspiration behind your business so your designer can really understand you. At Bloom, I ask clients to create inspirational mood boards in Pinterest. This gives me insight into your vision and preferred style, which ensures your brand truly feels like YOU. All of this research goes into your new, custom Squarespace website to make attracting your dream clients a breeze. 3. How will this website help my business grow? Your website is a huge part of your overall brand. Make sure your website showcases exactly what you want to stand for and offers quick and easy ways for it to capture and convert your traffic into prospective clients! A good designer will be able to answer how a new site will attract more business, and your ideal clients, to you. They’ll design it with the purpose of building your list, or selling your products, or whatever else is important to growing your unique business. The perfect Squarespace designer for you ensures they’re not only aligning your energy, but also aligning the form and function of the website to your business goals. This means they’re thinking about things like growing your email list subscribers, social fans/followers, promoting engagement and more -- while also keeping organic SEO optimization in mind. Your new website should be precisely designed to attract your ideal clients and inspire them to convert into loyal fans and future customers. 1. Do you provide training so I can learn how to edit my website? This is really important! The last thing you want to happen after you’ve bought a beautiful new website is to be confused about how to add a new blog post, or swap out a time-sensitive photo or graphic. Your Squarespace designer should walk you through how to edit the content on your site and other common tasks you’ll need to do to ensure your website stays relevant and sticky. At Bloom, I even record the training session so you have it to look back on anytime you forget something. Plus, my clients get an exclusive resource kit full of tips for maintaining your new Squarespace site and growing your online business! 2. Do you provide technical support after my website launches? Your web designer will test your website before launching it to the world. But sometimes things happen after launch that you’re just not sure how to fix, like if you accidentally adjust a setting you didn’t mean to, or somehow delete a section of your site (though, the nice thing about Squarespace is that these things are extremely rare!). You should work with a Squarespace designer who understands that you might need some ongoing support after launch. I offer a week of free tech support post-launch for this exact reason. I’d never want to leave you high and dry or feeling unsupported post-project! These questions are a good starting point to communicate with potential web designers you want to work with, but remember: your intuition is the best indicator of all. Trust your instincts, and work with someone you connect with. Looking for a new Squarespace website? Bloom is founded on the belief that the time to create something amazing is now. You have a gift and you’re ready to share that gift with the world. Our custom Squarespace websites are built to establish your brand and attract your dream clientele. If you believe in unlimited possibilities, and desire a six-sensory design experience, we should chat. BONUS: Grab the full checklist of 10+ more questions you can ask to find the designer who’s perfect for you!